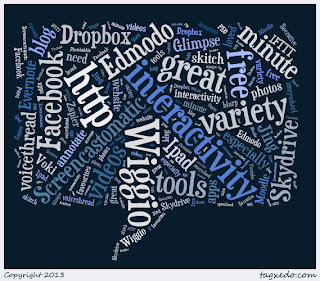 May 1st ELTChat Summary: What are your criteria for evaluating web based tools? The moderators of #ELTchat are still working their way through the wealth of material available from the video sessions of IATEFLonline. This week was no exception and the discussion centred on Nik Peachey’s session on the criteria needed to decide which web-based tools to use for the classroom. @Teacherphili thought the list was thorough and covered all the bases. @Marisa_C pointed out that the criteria would depend on the school or teacher making decisions about what was workable in their situation. In schools which have equipment there would be different needs to schools which have little access to technology. She suggested that she would create a list to suit her own teaching situation. @Wiktor_K asked for the definition of accessibility, which 2theteacherjames explained as being a cross-platform application. This is an important factor, as students who bring their own devices will use a variety of ios and android systems. And in @eannegrenoble’s case she has network security problems too. Some applications are only available on one operating system at the moment, which makes them less useful for class work. Are we looking at Apps or Web-based tools? Both! @Marisa_C mentioned that she doesn’t have access to apps in class, so web tools were her preference. Others were more interested in apps, but the criteria applies to both of them. Apps can be used as a prompt for teaching language and digital literacy too. This question aroused plenty of responses. Did it matter if it was for the teacher’s use, or the student’s? Most of us thought that it would be worth paying for tools if the premium version delivered a better product. @hartle made a good point about the chance of free tools being withdrawn from the market. Or, once you are reliant on them, they could start charging. @Marisa_C worried about losing content, and @hartle agreed as she had also lost content when tools disappeared unexpectedly. Another problem with free tools is the amount of advertising which creeps in. @MrChrisJWilson suggested using the adblocker plugin for chrome and added a word of warning: apps with ads drain device batteries fast! @Shaunwilden mentioned some institutions which have sets of tablets, and who are willing to pay for useful apps. For most of us that would be a dream, but the reality is that it would be more likely to hit our pockets. For institutions who do buy the tools, it is possible to get a reduction for bulk orders. How useful are bilingual apps? @MarjorieRosenbe worried that they might promote laziness. @nfholloway_neil warned against mistranslations , particularly with higher level students. @eannegrenoble agreed, and her comment showed that she had also had some experience with dodgy translations. Marjorie suggested that monolingual dictionaries and corpora were also valuable tools. So what would our criteria be? I’m not sure that is the right link to the Tricider poll. Should be https://tricider.com/en/brainstorming/ntNY as per Nik’s presentation. It was actually the link to the Poll, with the voting system in place.